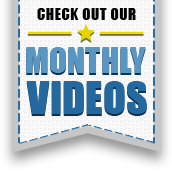 Ottawa, ON, May 15, 2017 – According to statistics released today by The Canadian Real Estate Association (CREA), national home sales declined in April 2017. National home sales fell 1.7% from March to April. Actual (not seasonally adjusted) activity in April was down 7.5% from a year earlier. The number of newly listed homes jumped 10% from March to April. The MLS® Home Price Index (HPI) was up 19.8% year-over-year (y-o-y) in April 2017. The national average sale price rose 10.4% y-o-y in April. Home sales over Canadian MLS® Systems fell by 1.7% in April 2017 from the all-time record set in March. April sales were down from the previous month in close to two-thirds of all local markets, led by the Greater Toronto Area (GTA) and offset by gains in Greater Vancouver and the Fraser Valley. Actual (not seasonally adjusted) activity was down 7.5% year-over-year, with declines in close to 70% of all local markets. Sales were down most in the Lower Mainland of British Columbia, where activity continues to run well below last year’s record-levels. The GTA also factored in the decline, with faded activity compared to record levels set in April last year. The number of newly listed homes jumped 10% in April 2017, led overwhelmingly by a 36% increase in the GTA. Housing markets in the Greater Golden Horseshoe also saw similar percentage increases. The jump in new listings and drop in sales eased the national sales-to-new listings ratio to 60.1% in April compared to 67.3% in March. The ratio was above 60% in just over half of all local housing markets in April, mostly in British Columbia and southwestern Ontario. The GTA downshifted into the middle of the balanced range in April, while Greater Vancouver and the Fraser Valley have returned to sellers’ market territory. 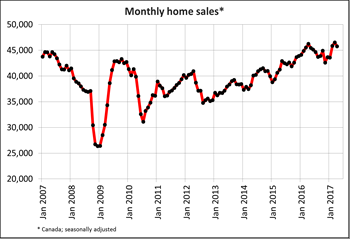 There were 4.2 months of inventory on a national basis at the end of April 2017, up slightly from 4.1 months in March when it fell to its lowest reading in almost a decade. Although new listings surged in the Greater Golden Horseshoe, inventories remain tight at near or below one month across the region. Ontario’s recent changes to housing policy were announced late in the month, so their full effect on the balance between supply & demand has yet to be determined. 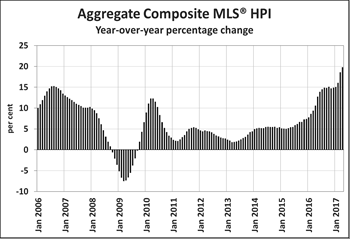 The Aggregate Composite MLS® HPI rose by 19.8% y-o-y in April 2017. Price gains accelerated for all benchmark housing categories tracked by the index. Two-storey single family homes posted the strongest year-over-year price gains (+21.8%), followed closely by townhouse/row units (+19.9%), apartment units (18.8%) and one-storey single family homes (17.2%). After having dipped in the second half of last year, home prices in the Lower Mainland of British Columbia have been recovering, are up from levels one year ago, and are now at new heights or trending toward them (Greater Vancouver: +11.4% y-o-y; Fraser Valley: +18% y-o-y). Meanwhile, benchmark home price gains remained in the 20% range in Victoria and elsewhere on Vancouver Island. Price gains were in the 30% range in Greater Toronto and Oakville-Milton, and ranged in the mid-20% in Guelph. By comparison, home prices eased in Calgary (-0.9% y-o-y) and Saskatoon (-2.6% y-o-y) and are now about 5.5% below their peaks reached in 2015. Home prices were up modestly from year-ago levels in Regina (+0.4% overall, led by a 2% increase in apartment prices), Ottawa (+4% overall, led by a 4.9% increase in two-storey single family home prices), Greater Montreal (+3.7% overall, led by a 5.5% increase in prices for townhouse/row units) and Greater Moncton (+4.8% overall, led by a 12.7% increase in prices for townhouse/row units). The actual (not seasonally adjusted) national average price for homes sold in April 2017 was $559,317, up 10.4% from where it stood one year earlier. The national average price continues to be pulled upward by sales activity in Greater Vancouver and Greater Toronto, which are two of Canada’s most active and expensive housing markets. Excluding these two markets from calculations trims more than $150,000 from the average price.